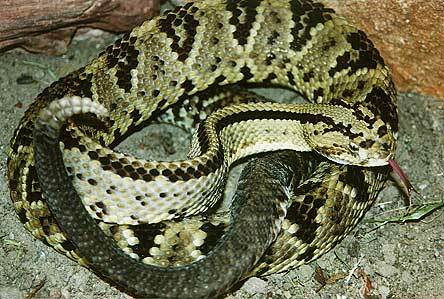 The 13 subspecies of this rattlesnake range widely throughout Central and South America. This member of the "durissus" group also has the recognizable triangular shaped body typical of this group of rattlesnakes. The Mayans honored the rattlesnake as an earthly representative of various deities, the best known probably being Quetzalcoatl, the Feathered Serpent. The rattlesnake, or Tzabcan, carved in stone, appears in many ruins of the great cities and ceremonial centers in Mexico and Central America. The snake ranges from central Veracruz, Mexico to central Costa Rica. It is quite agile and alert in behavior.